Exit Polls Of 5 State Elections 2017 India Released, Just Now, Results On 11th. Election of Assembly seats of 5 states got completed yesterday and exit polls were released today by many news and survey channels. Actual results will released on saturday, March 11th 2017. But all exit-polls are indicating that modi wave continues from 2014. Congress may only lead in Punjab along with AAP. Timesnow - VMR : BJP - 190-210, SP - 110-130, BSP - 57-74. ABP : BJP - 32%, SP - 28%, BSP - 26% Vote share. C-voter : BJP - 28, Congress - 20. C-voter : BJP - 15-21, Con - 12-18, AAP - 0-4. MRC : BJP - 15, Con - 10, AAP - 7. Chanakya : BJP - 53, Cong - 15. C-voter : BJP - 29-35, Cong - 29-35. India today - Axis : BJP - 4-7, Cong - 62-71, AAP - 42-51. 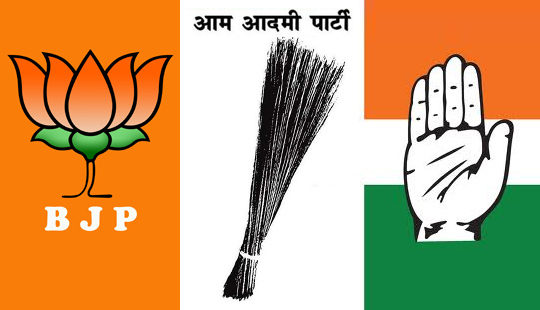 C-voter: BJP- 5-13, Cong - 41-49, AAP - 59-67. MRC - BJP- 6, Cong - 60, AAP - 50.